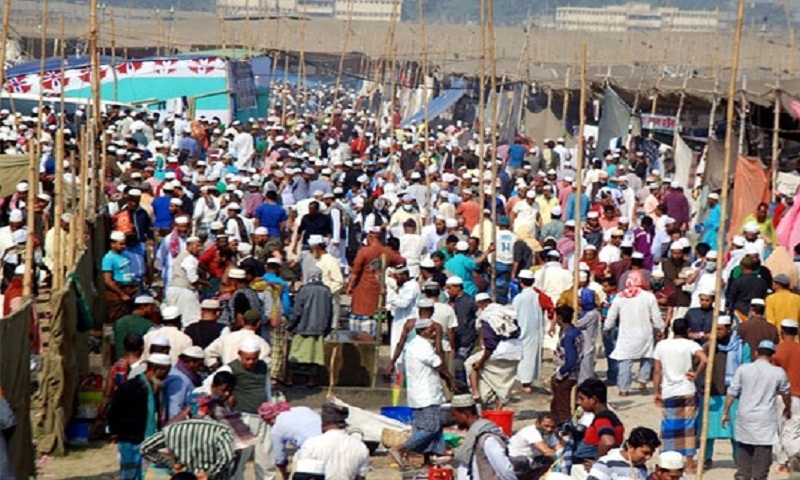 The two phases of the 54th Biswa Ijtema, the second largest congregation of the Muslims, has begun this morning on the bank of the Turag River at Tongi, on the outskirts of the city, amid tight security, report BSS. The first phase of the Ijtema began with ‘Aam Bayan’ (general sermons) by noted scholars after Fazr prayers today that will end with Akheri Munajat (final prayers) on January 16. The second phase of the Ijtema will begin on February 17 at the same venue and it is scheduled to end with Akheri Munajat on February 18. Prime Minister Sheikh Hasina today issued a message greeting the Muslim devotees all over the world on the occasion of the Bishwa Ijtema and wished all success of the four-day congregation. However, all preparations for the Ijtema, including setting up pandel, stage, floating bridge over Turag river and toilets have been completed. Gas, electricity and water connections were given to the Ijtema ground. State Minister for Youth and Sports Md Jahid Ahsan Rasel along with Tablig Jamaat’s senior leaders today visited the Ijtema ground to oversee the overall situation of the Ijtema ground. The Biswa Ijtema should be successful at any cost as per the Prime Minister Sheikh Hasina’s directives, he said after visiting the Ijtema compound. Later, Rasel inaugurated delivering medical services and medicine free of cost on the Ijtema-ground. Meanwhile, thousands of devotees from home and abroad started to throng the Ijtema ground since Wednesday night to take part in the religious event seeking divine blessings of the Almighty Allah. Tablig Jamaat has been organizing the Ijtema at this venue since 1967. However, the Ijtema is held in two phases since 2011 to ease the accommodation problem. Besides, foolproof security measures have been taken to hold the four-day Biswa Ijtema in a peaceful manner. Five control rooms, including Gazipur City Corporation, district administration, police, RAB and Ansar and VDP, have been set up to monitor the overall activities of the Tongi Ijtema. According to the sources, 15 watch towers of police and 10 of RAB have also been set up to ensure over all security of the devotees. Special measures have also been taken to ensure uninterrupted electricity and water supply during the Ijtema. Around 3.54 lakh gallons of fresh water will be supplied everyday through 13 deep tube-wells and 50 trucks will be engaged round the clock in removing garbage from the Ijtema ground. A total of 175 gas burner stoves were set up to provide cooking facilities for foreign devotees at the Ijtema compound and healthcare centres have been set up at different parts of the venue along with first aid and other treatment facilities to provide health care services to the devotees. Bangladesh Railway (BR) has launched four-day special train services on several destinations for the devotees participating in the congregation. As per the special train service schedule, a juma special train service will be operated on February 15 on the Dhaka-Tongi-Dhaka route, said a railway ministry press release. Two special trains will be operated to Tongi from Jamalpur and Laksham on February 17. A total of four trains in the name of “Monajat Special -1,2,3,4” will be operated on Dhaka-Tongi route on February 16, the day of first Akheri Monajat. On the day of second Akheri Monajat on February 18, eight trains will be operated on Dhaka-Tongi route, eight on Tongi-Dhaka, one on Tongi-Laksham, one on Tongi-Akhaura, four on Tongi-Mymensingh and two on Tongi-Tangail routes. Meanwhile, for convenience of travelling by the devotees, all inter-city, mail express and local trains heading toward the capital have been directed to halt at the Tongi Station for two minutes starting from February 12 and it will continue till February 18. All kind of commuter train services will be suspended during the Biswa Ijtema.